Integration involves the identification of relationships within and between information resources. 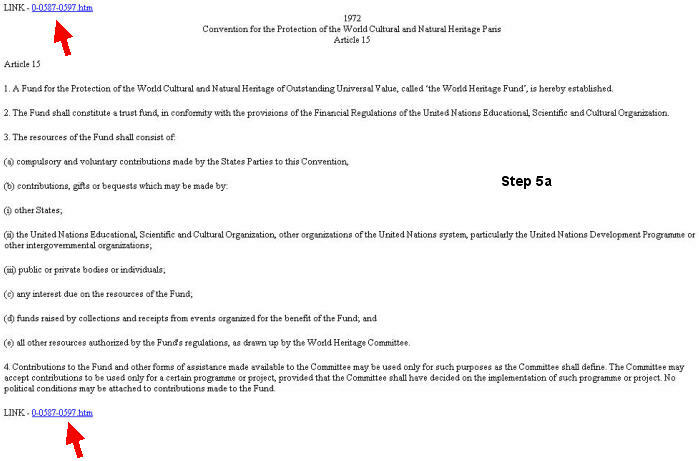 This guide is designed to assist with your accessing and integrating information contained in the international policy documents that have been compiled from the Marine Mammal Commission Compendium of Selected Treaties , International Agreements, and Other Relevant Document on Marine Resources, Wildlife, and the Environment (see the About page). For background on the legal principles and terminologies associated with the development and implementation of international policy documents, please refer to the Vienna Convention on the Law of Treaties. STEP 1. Open digital library via the INTEGRATE button (red arrow). STEP 2. Select Match "All" or "Any" (blue arrow). Enter your integration query in the box with the blinking cursor (green arrow). Push the Integrate button (red arrow). For information about applying your queries with the Match buttons, see the Integration Strategies section below. STEP 3. The "Java" applet symbol (Step 3a) will briefly appear on a separate screen followed automatically by an expandable-collapsible hierarchy (Step 3b), which objectively organizes the relevant policy documents in chronological order based on the years that they were signed. The hierarchy screen also identifies how many granules (see the FAQ page) have been retrieved from among the 8460 granules that have been automatically generated from the 661 policy documents in the digital library (see the About page). These granules can be articles, annexes, appendices and other self-contained policy units within the policy documents. Granules provide direct and quick access to relevant contents, without requiring the user to read through large amounts of surrounding information to find this content. The "1266 documents [granules] in this tree" all contain the term "organization," either in uppercase or lowercase (see below for information about case sensitivity). STEP 4. To expand a hierarchy (e.g., Step 3b), click the plus [+] signs. To collapse the hierarchy, click on the minus [-] signs. Clicking a plus [+] sign once, will expand the next level in the hierarchy, which identifies the names of the relevant policy documents that were signed within and between years (Step 4a). 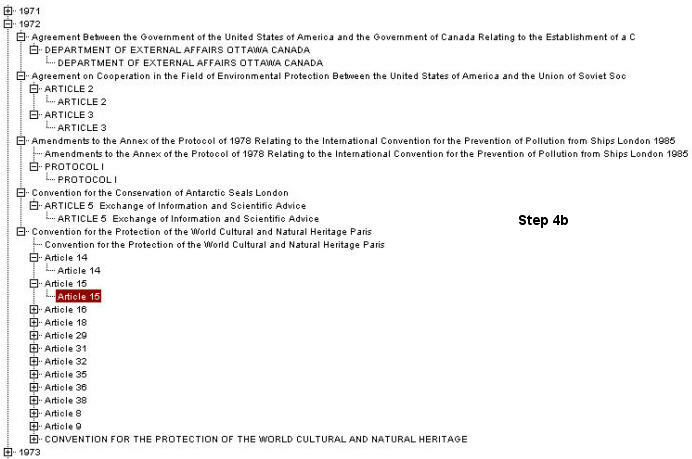 Clicking the plus [+] sign again, will expand the next level in the hierarchy (e.g., 1972 from Step 4a), which further identifies the names of the granules within and between the relevant policy documents (Step 4b). STEP 5. Clicking on the name of any granule (e.g., Article 15 from Step 4b) will expose its contents in a new window (Step 5a). [NOTE: If your computer blocks pop-up windows, hold the CONTROL key on the keyboard while clicking the link. See the FAQ page for additional information]. A search term will be highlighted if it is an exact match. In this example, "Organization" and "organizations" in Article 15.a.ii are not exact matches for the query, "organization" (as described in Step 3). To view the entire document that contains the granule, click on the link (red arrow), which will open this document in a new window (Step 5b). 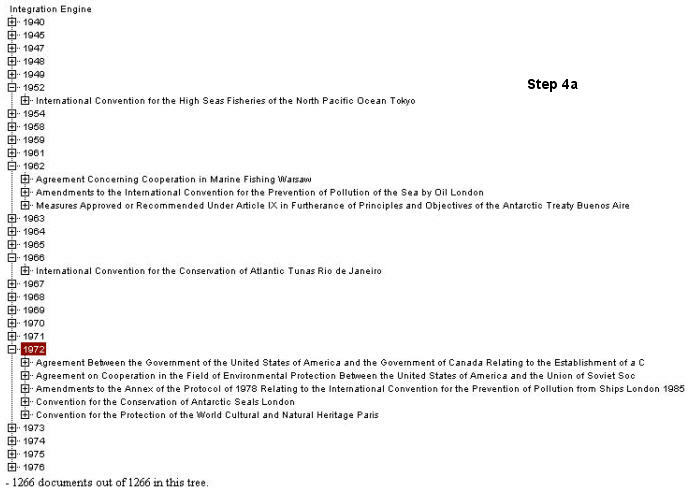 The text format of the entire document follows from the hardcopy versions in the Marine Mammal Commission compendia. The patented Digital Integration System (DigIn®) from EvREsearch LTD provides unique capabilities to access and integrate digital information (see the About page). In contrast to ranked lists, relevant results are displayed in expandable-collapsible hierarchies that comprehensively identify objective relationships within and between information resources. Any: Matches any of the search terms with the indexed contents of the information granules. The resulting hierarchal display will provide access to those granules that contain at least one of the search terms. All: Matches all of the search terms with the indexed contents of the information granules. The resulting hierarchal display will provide access to those granules that contain all of the search terms. After selecting the appropriate "match" option, you can enter your queries and then click on the Integrate button. "Unfortunately, we didn't find any policy documents containing terms that match your search query. You may want to visit our Quick Integration Guide page to better refine your queries. If all else fails, please write to us at paul@evresearch.com and we will assist with your search." Wildcard [*]: The asterisk is a wildcard representing any four or fewer letters or numbers of a search term. The asterisk is a powerful search tool, but has some limitations. It cannot span words. For example, the query "wildcar*epresnting" would not match the terms in the first sentence of this paragraph. To avoid overly broad searches, the asterisk can only be used in words or phrases that have at least three alpha-numeric characters (e.g., a search for "th*" would be ignored). However, a search with "the*" will retrieve "there," "their," "thereof," "therein" and other terms with "the" root. Only queries with words or phrases that contain an upper case character will be treated as case sensitive. For example, a search with "usa" would match "Usa", "USA", and "usA", while the term "USA" would match only its uppercase version. Wildcard [*] attached to a word root will generate case-sensitive results. The DigIn® search and integration capabilities with this digital library are best illustrated with a few examples that employ Boolean operations. The More Detailed Your Query, The More Relevant Your Results.